If you’ve ever dropped your phone, and picked it up to find it smashed or broken, the following days might have been full of mini-realizations of just how much we depend on our phones for modern life. Between making plans with your loved ones, reading up on news, conducting business, and time spent browsing Instagram or Facebook (that we often don’t want to admit to), these devices end up holding many parts of our lives. 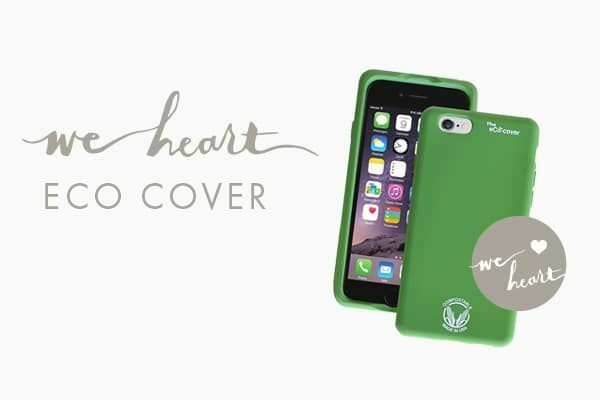 For this month’s We Heart, we are featuring The eCo-cover, a product that will certainly protect your iPhone from these devastating drops, but that is only the beginning of what really got us excited about this phone case. While with normal use, The eCo-cover will last about 10 years, if you were to put it in your compost pile, it would fully breakdown in about 90 days. This is because The eCo-cover is made from a highly durable non-GMO “corn-rubber.” This “green” material means a couple things, it avoids landfills, it is BPA-Free, BPS-Free, Lead-Free and all around “Baby Safe,” so no need to panic if your teething child takes a gnaw or two on your phone. The eCo-cover is manufactured in Nebraska. While there are a whole slew of benefits to supporting companies who manufacture domestically, some important ones are job growth, fair labor and wage standards, as well as stricter environmental regulations than the regions that typically produce the bulk of the world’s plastic and rubber products. While still sleek this ‘corn-rubber’ is high-density which gives it a soft, comfortable, non-slip feel that cushions the blow of drops and allows the phone to bounce back (we may have unintentionally tested this feature in the office…). The covers' sides curve over the front working as a top bumper, protecting the display glass from breakage and scratches. You may have noticed that at Annmarie Skin Care we are constantly trying to find ways to be better to our bodies (starting with skin!) and we do so as sustainably as possible. We found that our philosophy aligned with The eCo-cover's commitment to creating non-toxic products and doing so in an earth-friendly way, so we thought we would connect you with them. Just visit The eCo-cover website here and enter WeHeartEcoCover when checking out. You can use this code Friday, August 12th, 2016 through Friday, August 19th, 2016. We are so excited to introduce you to this amazing product, and we look forward to hearing how you like it! Already using The eCo-cover? Tell us about your experience in the comments section below! EWG – Does your Cell Phone Case Raise your Radiation Exposure? Wow, its happy to see that eco cover. Due to the pollution, it’s an important point that keeps safe our environment and also protects the phone. I require 2 covers for my phone, Out of two already one got from mobansp online store & one left. If possible then I will sure buy this product.